Our backs are against the wall! We’re only days away from the November 6 elections and frankly, it’s “do-or-die” time. Our direct mail, mass email, online ads, radio ads and door-knocking programs are running full tilt but we need your help to keep them going. The fact is, our backs are against the wall. Radical anti-gun groups, funded by New York BILLIONAIRES who have nothing in common with our Ohio way of life, are funding a massive assault on our state to take control of our government in order to annihilate our Second Amendment rights. They have an ARMY of paid door-knockers, phone bankers and activists working around the clock to turn out the anti-gun vote! 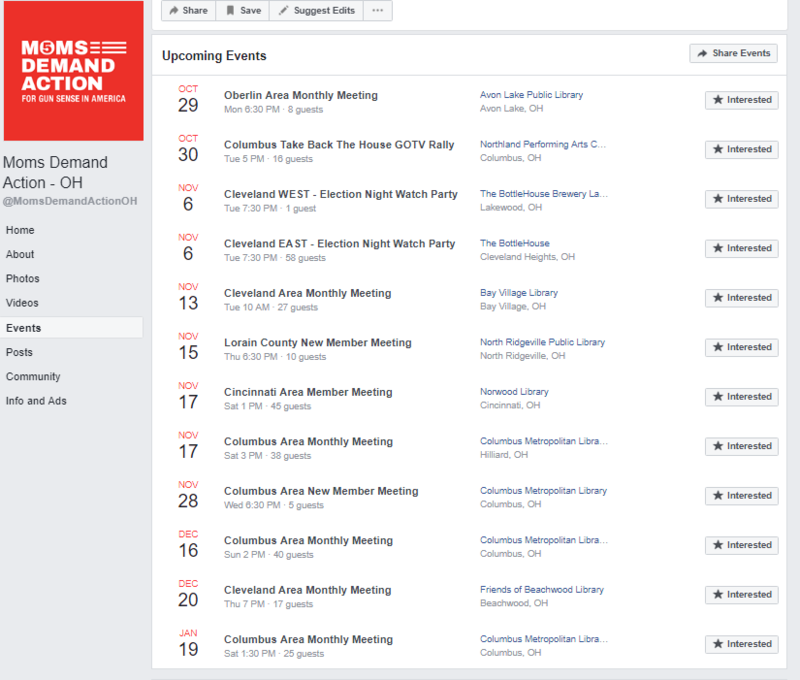 Below are images from the Bloomberg-funded “Moms Demand Action – OH” Facebook “Events” page, detailing the massive amount of effort they’re putting in to electing radical anti-gunners in Ohio. 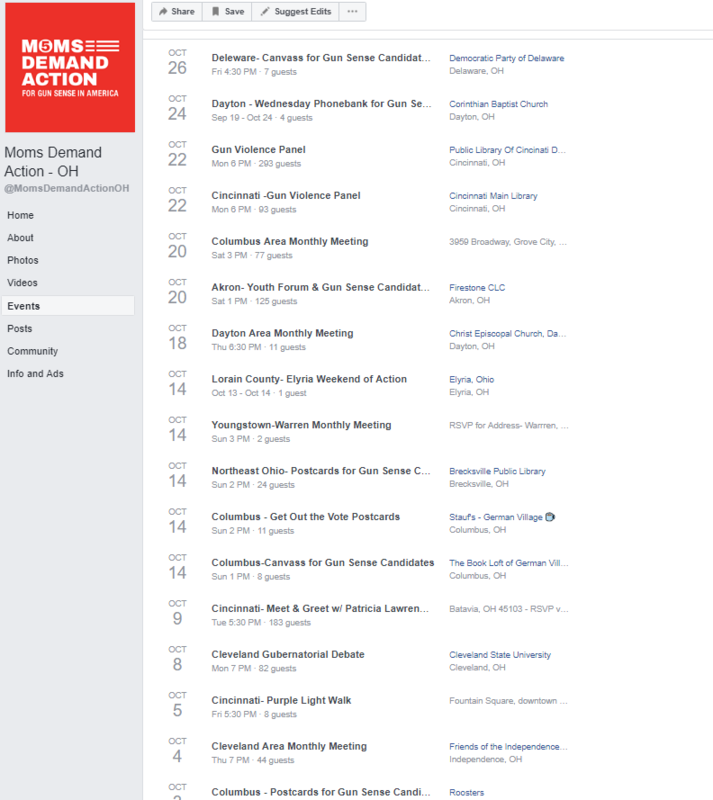 And as you can see, they’re loaded up with activist events between now and election day, beating the drums for gun-control by knocking for anti-gun candidates! But they aren’t stopping on November 6th. As you can see, the anti-gun groups have laid it all on the line with a massive statewide mobilization plan to steal our elections, but they’re marching right past that into our Lame Duck session! We’ve got to FIGHT BACK! Please take a moment and make an emergency contribution to help Ohio Gun Owners increase the amount of mail, email, radio ads and online ads that are taking place in targeted districts across the state right now! Whether that’s $5 or $500, we need your help right now. With only nine days to go, Bloomberg’s hoards are only increasing their attacks on pro-gun candidates and our gun rights. We’ve got to meet political force with superior political force and that’s exactly what our programs are designed to do. So please consider an emergency contribution of $250 or $500 right away to help us EXPOSE anti-gun candidates in targeted districts all across Ohio! If that’s simply too much, please consider $100, $50 or $25 right away. All the resources you give us go straight to the fight to stop these radicals from turning our Ohio into another California-style gun control stronghold.